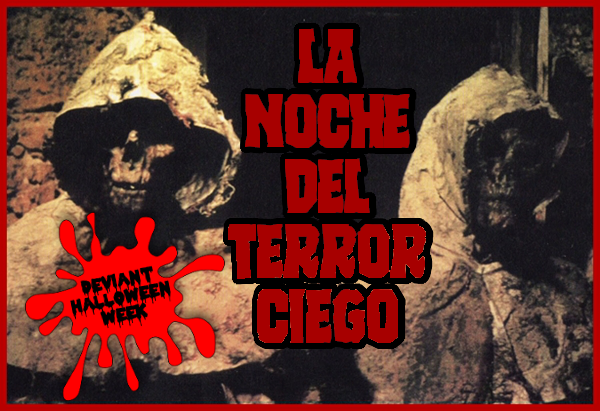 Amando de Ossorio's Tombs of the Blind Dead is an awesome example of 1970's European horror...and we have it here for you on today's edition of our DEVIANT HALLOWEEN WEEK! What can I say about this old gem that hasn't already been written about or said? Hmmm...well...when I first watched the film it was on a summer's day in Boston after a long day of skateboarding with some friends. I was about 13-ish back then and one of my friends had the film on VHS. Ahhh....VHS. Well...I vividly remember watching the film because of my friend wetting himself during one of the slow motion scenes where the blind dead knights ride up on horses. I was sitting on the same couch and felt the warm urine working its way through the couch cushion onto my person. In his defense, he was a chronic wetter...and pretty much wet himself whenever he was nervous. I only point this out because I'm pretty sure that people urinating on other people doesn't really get mentioned much whenever discussing La Noche Del Terror Ciego...if at all. Anyway...please enjoy Amando de Ossorio's atmospheric classic...Tombs of the Blind Dead!